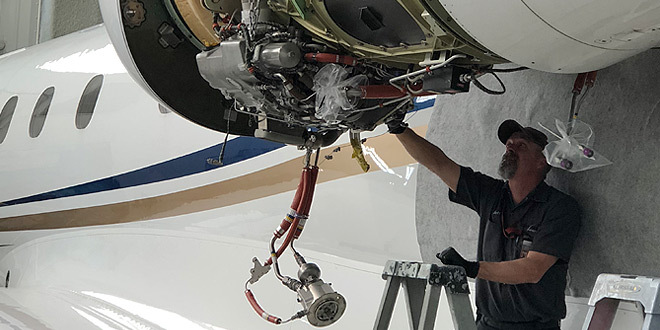 An Embraer Legacy 450 recently underwent removal and installation of rental engines, in addition to other inspection and maintenance events at its Grand Junction, CO (GJT) location. As an Authorized Honeywell Line Service Center for the HTF7500/AS907 series engine used on Legacy 450/500 aircraft, West Star has the necessary capability to process MSP, special programs and warranty service if required. Additionally, West Star is proud to be an Embraer Authorized Service Center at all three of their full-service facilities in East Alton, IL (ALN); Grand Junction, CO (GJT); and Chattanooga, TN (CHA). Together, these authorizations allow West Star to be a true one stop shop for all your Embraer / Engine requirements. In addition to Legacy 450/500 support, as an Embraer Authorized Service Center, West Star can service Phenom 100/300, and Legacy 600/650 at ALN, GJT, and CHA. The ALN facility also supports the Lineage 1000 series. West Star provides full-service maintenance including: Avionics repair and installation, airframe and engine inspections and repair, along with full interior and exterior refurbishment on today’s most sophisticated airframes.